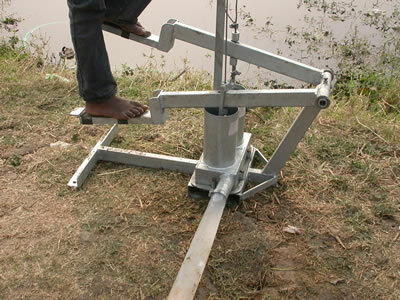 A Treadle pump is a foot operated water lifting device that can be used by smallholder farmers to irrigate their land in places where the water table is high. 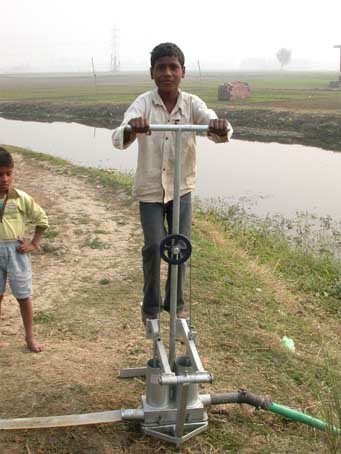 A treadle pump is a simple, cheap, and effective device for lifting water. In this technology, bamboo levers are pushed repeatedly by foot to provide the driving power to lift water. This simple device is relatively easy to install and maintain and is environmentally friendly. Three types of treadle pumps are in common use; all three use the cylinder and paddle concept, but the model which uses a cylinder 8.9 cm in diameter and has bamboo paddles is the one most commonly favoured by farmers in the region. It is cheaper and can lift more water than a comparable hand pump. On average, a treadle pump can be used to lift water from about 6 m underground and one such pump can irrigate as much as 0.34 ha of land (depending on the soil type and other conditions). In addition to lifting water for irrigation, the treadle pump can also be used for a variety of domestic purposes. In the Terai areas of Nepal, it is also widely used as a means of generating income. When farmers consider installing a treadle pump, they first need to verify whether there is sufficient groundwater to merit the expense. Treadle pumps should be installed by trained technicians and properly maintained throughout their lifetime. If possible, an extra set of spare parts should always be kept on hand and a trained technician should be consulted for major repairs.